Before you start reading, let me make it clear that I respect Mr. Roger’s very much. (Some people get all bent out of shape when you start talking about Mr. Rogers). I think he had a great show. I loved watching him feeding the fish and coveted that playset he got out in his kitchen each and every time. I WANTED IT TO BE MINE. I also was very jealous of his kitchen traffic light. However, every time I watched Mister Roger’s Neighborhood as a child, the same things always stressed me out. #5 Mr. McFeely always being in a rush. I was always wishing he would just slow it down a dadgum bit. If there was ever a show where Mr. McFeely delivered something to Mr. Furley, I’d need a tranquilizer. It would take me a long time to calm down after watching that McFeely-Furley episode. I get heart palpitations just thinking about it. #4 Looking at this lady. 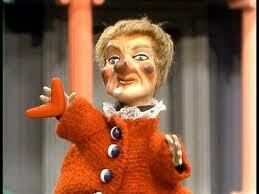 A better name for Lady Elaine is Lady Huh?-Laine, youknowwhati’msayin? I was always perplexed over Lady Elaine’s skin condition. Did she fall into a fire? Was someone making s’mores out of her nose and some graham crackers? Did she just try to pet a dragon? Did she trip and fall in dog poo? She needed some serious medical help and got placed into a spinning museum instead. The other stressor: THE SPINNING MUSEUM! #2 Figuring out the voices behind the puppets. I could never concentrate on the storylines in The Land of Make Believe because I was always trying to figure out which puppet Mr. Rogers was operating. It turns out he was just about everyone on that whole strange make-believe set, even Queen Sarah Saturday, Henrietta Pussycat and Lady Huh?-laine. Okay, I’m stressed out all over again. Have I seen your face over on Facebook or Twitter yet? No? What’s the deal with that? Remember, all new likers get a free Coke from my vending machine up in the top right corner. Sit in that orange chair, too, if you need to take a break. The only thing I ask? NO HEATING OF BEAN BURRITOS IN THE BREAK ROOM’S MICROWAVE. We’ve had a lot of trouble with those.